As we continue to countdown towards our next Kickstarter, here is a little more information on the GECS we discussed in yesterdays post. GECS facilities are located across the globe in the center of the most heavily fortified cities that remain on the planet. In addition there are several located in the lunar colonies as well. These are among some of the most heavily guarded areas as they are key in humanities fight against the armies of Cthulhu. The facilities utilize advanced computer systems that scan vast databases of human genetic material to determine the ideal combination that will produce an optimal soldier. As such, GECS are as varied as the human race and each batch differs from one to the next. Once the materials are chosen they then go through a process to accelerate gestation and growth. The current process can produce a full grown GECS in just 32 days. They then go through several weeks of neural information transfer that provides them with all of the military tactics and information that can be taught in this manner. Then finally they go through a two week ‘breaking in’ period where their physical and mental abilities are tested.Once this is passed they are assigned their armor and dispatched into the field. The attached image is some of the artwork of a female IRE trooper. 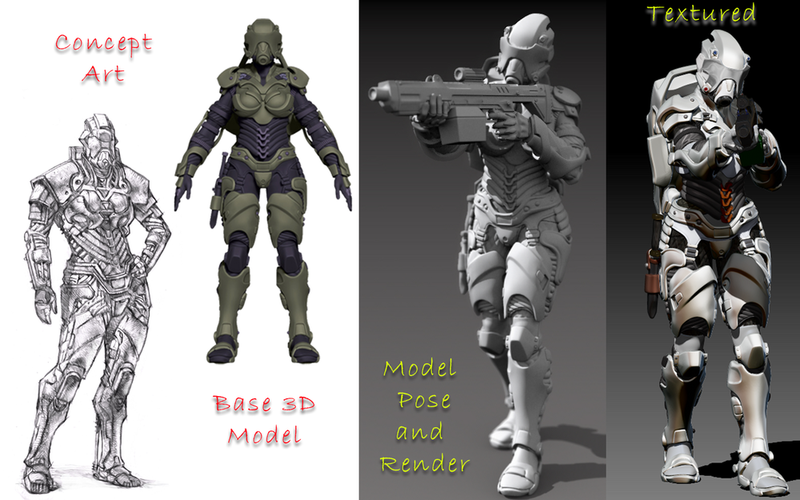 The models pose is one of those that will be available in the Kickstarter. The models come unpainted and will require assembly. The textured version is simply included to give an example of what a paint scheme might look like on a finished model. That’s all for today’s update, stay tuned for more information over the next few days!